Sitting in remote waters of the Pacific, surrounded by shark infested waters, is one of Panama’s most disturbing and haunted places. Coiba Island Prison was used to house some of the most vicious criminals in Panama, as well as political prisoners during the rule of dictators Omar Torrijos and Manuel Noriega. It was during it’s time as a prison for political activis...ts, that Coiba saw some of it’s darkest days. Prisoners were allegedly beaten, tortured and even dismembered before being fed to the sharks that inhabit the waters surrounding Isla Coiba. The people who were unfortunate enough to end up at Coiba Island because of their political beliefs came to be known as “Los Desaparecidos” or “The Disappeared”, as they were usually never seen again. The prison consisted of around 30 different buildings, including a chapel and an eerie jungle graveyard. It was always surrounded by the thick jungles of Panama, but since it’s retirement as a prison in 2004, has become overrun by its surroundings. Both plant and wildlife have crept upon the old prison, making the allegedly haunted prison even more menacing in appearance. Tales of paranormal activity have long been associated with Coiba prison. Both former prisoners and employees are open about their experiences and beliefs regarding Isla Coiba. One prisoner is known to have escaped the prison, for reasons that may surprise you. The prisoner fashioned a homemade raft and risked life and limb in a desperate escape. Although he wasn’t running from his punishment. He was running from Ghosts. He was unable to remain confined on Isla Coiba because of his immense fear of the ghosts and spirits that inhabited the prison along with him. Another story involves an angry guard, who was seen chasing a prisoner. When the guard finally caught up to the fleeing man, he was horrified to discover that he hadn’t been chasing a man at all. Instead, he had been chasing a something not of this world. At least that is what some witnesses described. It is not quite clear what happened when the man discovered that he had been chasing a ghost, but the guard put a bullet in his own head a short while later. Many say that he was so disturbed by what had happened, that he took his own life. You can’t help but wonder what the guard must have discovered and whether or not it played a part in his demise. There are many other stories surrounding this remote island in Panama. Ghostly apparitions and blood curdling screams echoing from the prison are commonly reported. The sounds of rusty cell doors slamming shut, footsteps and voices are also reported. One ghost in particular is believed to be a former guard. He was seen frequently by other guards and prisoners. He is said to make his presence known by sliding his night stick across the metal bars as he walks the corridors. It just so happens that this too, is a regularly reported noise heard in Coiba Island Prison. 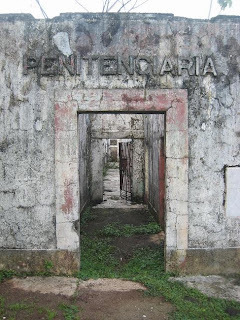 The fear of this prison both during it’s time as an active penal colony and afterwards as a place teeming with spirits, has kept most people away and left much of the surrounding jungle untouched. Whether the ghostly activity on the island is the result of emotional pain and tragedy, (as seen in the history of many other haunted prisons) or whether the unmarked jungle graves of former prisoners are to blame, there is certainly something strange about this island. For now the old prison sits in ruin, slowly being swallowed up by the jungle and waiting for the next brave souls who dare to enter it’s gate.